Force Control Switches are an inexpensive solution when load trip points are needed and live display is not necessary. The switch output can trip alarms, temporarily disable controls or be used as a PLC input. Applications include overload protection, slackline prevention and batching. 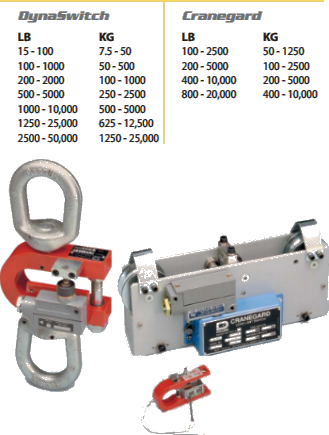 Often used with cranes, overhead hoists, elevators and within manufacturing presses. Dillon Force Control Switches can be outfi tted with several trip points and are precisely set at the factory. Trip points may be set anywhere within the range shown. The DynaSwitch is the most economical answer for load detection. Designed to be installed anywhere in line. 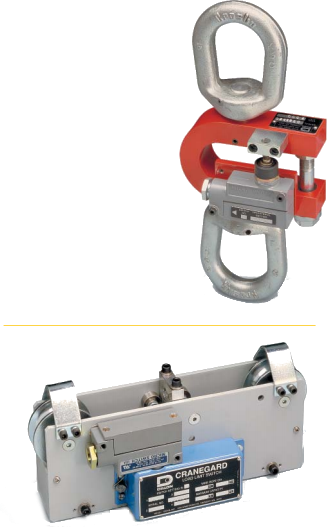 The Cranegard clamps directly on cables with no line cutting required. The Cranegard is ideal for wire rope hoist, elevator and crane overload prevention, and slackline detection.